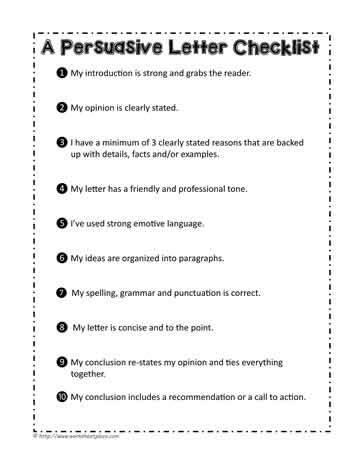 A persuasive letter checklist to help guide the writing of something persuasive. My introduction is strong and grabs the reader. My opinion is clearly stated. I have a minimum of 3 clearly stated reasons that are backed up with details, facts and/or examples. My letter has a friendly and professional tone. I’ve used strong emotive language. My ideas are organized into paragraphs. My spelling, grammar and punctuation is correct. My letter is concise and to the point. My conclusion re-states my opinion and ties everything together. My conclusion includes a recommendation or a call to action.